Christopher Thompson, a local academic historian, a former Town Mayor of Wivenhoe, a founding member of the Wivenhoe History Group and a Senior Research Fellow of the Humanities Research Institute at the University of Buckingham, delivered an impressive talk on the De Vere family and their impact on Wivenhoe in the 1400s and 1500s. 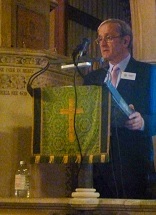 This talk was given in St Mary’s Church on Friday, 11th October 2013 and was attended by 120 people. It would seem from the research Christopher Thompson has undertaken that Wivenhoe Hall, built initially by John De Vere, 12th Earl of Oxford, in the 1440s was considerably extended in about 1485 when 80,000 bricks were commissioned. This made it a far larger Hall than anyone today realises. At the height of the family’s fortunes, around the year 1500, the Hall would have had a staff of 48 people. It would have been a building larger than that at Layer Marney. This would have been at a time when the population of Wivenhoe would have been little more than 200 people and a time really before Wivenhoe’s reputation for ship-building and fishing had become established. It was sold by Edward de Vere, 17th Earl of Oxford in the late 1500s. By 1594 the house was suffering from decay and was last shown on a map of Essex of 1611. 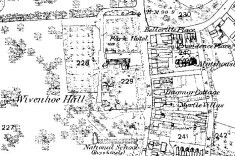 In a later map, of 1627, it had pretty much disappeared altogether although a small wing of the extensive Hall survived into the early 1900s. A tiny part survives today and is known as the Folly. No detailed drawings of the original Hall have ever been discovered but it was certainly the largest house ever to have existed in Wivenhoe, if not in Essex. There is a really useful hereditary map of the De Vere’s from Aubrey de Vere (born 1040, died 1112) through to Henry De Vere, 18th Earl of Oxford (born 24Feb1593, died June 1625) which has been published by the De Vere Society (www.deveresociety.co.uk) Click here for a link to the map in pdf format. The last will and testament of John de Vere, 13th Earl of Oxford (died 1513) can be found transcribed by clicking here. His second wife’s will (dated 1537) can be found by clicking here. She is buried in our parish church here in Wivenhoe. The will of the 16th Earl of Oxford, who died in 1562, can be found by clicking here. The following is the text of a Lecture given by Christopher Thompson on Friday 11th October, 2013 in St Mary’s Church, Wivenhoe to 120 people. Christopher Thompson is a Senior Research Fellow of the Humanities Research Institute at the University of Buckingham. He is also a founder member of the Wivenhoe History Group which is committed to conducting research into different aspects of Wivenhoe’s rich past. The de Vere family probably originated from Ver in Normandy. Aubrey de Vere was one of the beneficiaries of the Norman Conquest, although whether he fought at the battle of Hastings in 1066 is not certain. Twenty years later, he held nineteen manors, eight of them in Essex which remained the core of the family’s landed estate for the centuries to come. His namesakes and successors were awarded the title of Earls of Oxford in 1141 by the Empress Matilda during her struggle for the throne with King Stephen and confirmed in the title for switching sides to support Stephen by King Henry II. The de Veres were never very wealthy landowners and, by the standards of other Earls, were relatively poor. Part of the reason for this was that they tended to marry either gentry heiresses who did not bring much land with them or missed out on the really wealthy noble heiresses. They also experienced the drain on their resources that a number of long-lived dowager countesses imposed: the widows of the 8th, 9th and 11th Earls drew their incomes from the family’s estate from 1371 to 1453. The one great advance the family made, which happened in the reign of Richard II, was the rise of the 9th Earl, who became Marquess of Dublin and Duke of Ireland: his career, however, ended in marital problems, military defeat and exile where he died in 1392. His successors were much more careful and cautious. This is where the connection between Wivenhoe and the de Veres begins. 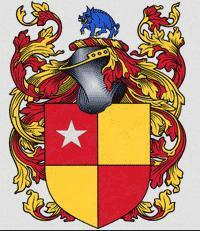 John de Vere was born in April, 1408, the eldest son of the 11th Earl of Oxford. His father died in 1417 leaving him in the wardship of King Henry V’s relatives, the Dukes of Exeter and Bedford. The former arranged John de Vere’s marriage to Elizabeth Howard, the heiress to her grandparents’ estates in East Anglia and Essex and also to those of her mother, Joan Walton. 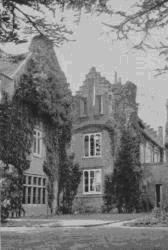 (Walton Hall to which the family gave its name still survives on the road between Linford and Mucking in the South of the county.) Amongst the twenty-eight manor she brought to the marriage was that of Wivenhoe. The marriage turned the 12th Earl of Oxford from being a poor Earl into one in the middle ranks of the English peerage and produced at least eight children who survived into adulthood, five of them boys and three girls. At some stage in the 1440s, John de Vere and his Countess had a large house constructed for them here in Wivenhoe. Our first surviving letters from Wivenhoe date from 1451. They are not terribly exciting, just the sort of correspondence one might expect from the household of an important peer dealing with the affairs of his household and locality in Essex, Suffolk and Norfolk. One of the Earl’s allies, Thomas Denys, the Coroner of Norwich, for example, wrote from here to John Paston in Norfolk in March, 1451 about the Earl’s movements and about legal business he proposed to conduct when he came to Norfolk. Oxford himself wrote a few weeks later to ask Paston to help one of his brother, Sir Richard de Vere’s servants, in a suit then being conducted with a local landowner in Norfolk. Thomas Denys was able to count on the Earl’s support in his attempts to woo a prospective wife no later than May, 1453. Denys, moreover, was the object of an interesting complaint to the Parliament of 1454 by another Norfolk figure, Walter Ingham. He alleged that Denys had forged a letter in Oxford’s name instructing him to travel to Wivenhoe to discuss “divers great matters touching my said Lord” only to waylay him en route with armed men in an attempt to settle a dispute over money: according to Ingham, he was grievously wounded in the ensuing skirmish. Denys was imprisoned in the Fleet prison as a result but the final outcome is not known. More interestingly still, we have letters from the Countess of Oxford a year or more later asking for John Paston’s help in resolving a dispute over a Norfolk manor in favour of James Arblaster and later thanking him for his good will towards Arblaster and his wife, Agnes. There are similar letters written from Wivenhoe over legal matters and debts from the Earl of Oxford in 1460 and 1461. Both the Earl and his Countess appear, prima facie, to have been devoted to the adoration of the Holy Trinity to judge by their salutations at the end of most of their letters from Wivenhoe. Such letters give them a degree of humanity we should not otherwise be able to appreciate. Like other Lords and landowners, the 12th Earl could not entirely avoid military service in France in the latter stages of the Hundred Years’ War but his service was brief (in 1436 and 1441-1442). He was also involved in local quarrels with the Bishop of Norwich and the Dukes of Norfolk and Suffolk in East Anglia. But, although he was initially sympathetic to the complaints of Richard, Duke of York about King Henry VI’s regime in the early-1450s, he managed to distance himself from the struggles between supporters of the King and adherents of the Duke of York in the late-1450s. He was not involved in any of the battles of that period: he did not appear at any of the partisan Councils or Parliaments of those years; and had no close links with any of the main protagonists. Of all the men of his rank, he was the only one who succeeded in remaining neutral. This is why his arrest and execution for conspiracy against the new Yorkist King, Edward IV, in February, 1462 was and is so surprising. Oxford was not a partisan figure at all. His eldest son and heir, Aubrey de Vere, was, however, almost certainly a supporter of the deposed King, Henry VI, and of Henry’s formidable wife, Margaret of Anjou. There is some evidence that men in the Earl of Oxford’s affinity – the grouping of allies and friends, officers and tenants associated with the de Veres – were in touch with Margaret of Anjou and involved in a conspiracy with her. John Montgomery of Great Tey and William Tyrell of Gipping in Suffolk fall into this category. Oxford, moreover, was on good terms with one of the rising Yorkists, John Howard, the future Duke of Norfolk, of Tendring Hall at Stoke by Nayland with whom he had on occasion hunted. The involvement of the 12th Earl of Oxford in this conspiracy was totally out of character and his execution at the hands of Edward IV’s regime was to have consequences no one could have foreseen at that time. The de Vere estates, including Wivenhoe, were seized in the aftermath and granted some months later to Edward IV’s younger brother, Richard, Duke of York. The King pardoned the dowager Countess of Oxford in May, 1462 and allowed Margaret Neville, the sister of his most important backer, the Earl of Warwick, to marry John de Vere, the heir to the de Vere title and estate sometime between August, 1462 and July, 1463. Early in 1464, Edward IV restored the 13th Earl to his family inheritance. He was allowed to re-inter his father’s body and proved an energetic participant in local government in the Eastern counties. He was on friendly terms with the Bourchiers, Earls of Essex, whose house at Halstead was not far from his own house at Castle Hedingham and with John Howard, hunting with him at Lavenham on at least two occasions in 1465 and 1466. But this reconciliation with Edward IV’s regime was only superficial. For the Yorkist regime, for Edward, his brothers and supporters, the 13th Earl of Oxford had a deep hatred and loathing. His father-in-law, Richard Neville, the king-making Earl of Warwick, was, by the late-1460s, increasingly alienated from Edward IV and prepared to do a deal with Margaret of Anjou to restore Henry VI to his throne. Oxford, indeed, was probably the only man equally acceptable to the Lancastrian partisans around Margaret of Anjou and to the Neville family. When the Earl of Warwick fled to France in March, 1470, Oxford went with him and returned with him to overthrow Edward IV in the following September. As temporary Constable of England, Oxford was able to oversee the execution of the Earl of Worcester who had presided over his own father’s trial and execution and to play a prominent role in commissions in Essex, Suffolk and Norfolk. But Warwick’s triumph did not last long. Despite Oxford raising 4,000 men in Essex and East Anglia, Edward IV successfully landed in England and defeated Henry IV, Warwick and Oxford at the battle of Barnet on 14th April, 1471. Oxford’s men were caught up in the fog enveloping the battlefield, pursued their immediate opponents but were overwhelmed by Edward’ s forces when they returned to the battle. Oxford lost everything. He fled to Scotland and then to France before attempting abortive invasions at St Osyth in May, 1473 – at least 10 men from Wivenhoe joined him – and at St Michael’s Mount in Cornwall in the following September. It was to no avail. He was forced to surrender in February, 1474. His life and those of his brothers as well as his friend, the Lancastrian Lord Beaumont, were spared but he was attainted and sent to the Castle of Hammes near Calais as a prisoner for the next ten years. His fate was better than those of his mother and wife. His mother was by the early-1470s elderly and frail. Her husband and eldest son had been executed for treason and three of her remaining sons were about to be attainted for treason as well. She appeared to be a landowner without legal heirs despite having put her estates in the hands of feoffees – trustees in modern parlance – to ensure that her will would be performed and to the benefit of two of her daughters. But, at Christmas 1472 when she was living in sanctuary at the nunnery of Stratford-le-Bow in Essex, she was visited by Richard, Duke of Gloucester, the younger brother of King Edward and the future Richard III. He told her that the King had given him her lands and apparently threatened her with being sent to the North of England. According to contemporary accounts, she was greatly distressed. Her trustees resisted for over a year before Duke Richard got his way. Although Gloucester later claimed that he had offered the dowager Countess an annuity of 500 marks for life, this was worth less than half the value of her estates. There is other evidence to show that Gloucester deprived the widowed Countess of Warwick in June, 1473 of her lands with the King’s connivance. The historian who has looked most closely into these matters concluded that the stories of the dowager Countess’s coercion were, on balance, probably true. Shortly thereafter, in 1473, she died. The 12th Earl’s wife was treated even more harshly. She was deprived of her title and, without lands of her own, was deprived of any dower out of her husband’s estate. One chronicler, Robert Fabyan, reported that she had to live on the charity of her friends and what she could earn from sewing. One London mercer left her money in his will in 1478 and the Duke of Norfolk made two separate gifts of 20 shillings each to her between 1483 and 1485. It was not until 1482 that she was finally granted a pension of £100 p.a. That must have been a great relief although small in comparison with the income she would have had in her father’s or husband’s households. What happened to Wivenhoe Hall? It passed first of all to Richard, Duke of Gloucester and was then sold by him for 1100 marks in 1481. The purchaser was the man I have already mentioned several times, John Howard, later 1st Duke of Norfolk. John Howard was a relatively local man. He was the son of Robert Howard (d.1436) and one of the daughters of Thomas Mowbray, Duke of Norfolk (d.1399). We do not know exactly when he was born but it was probably in the mid-1420s. He inherited a small estate from his grandfather in 1437 called Tendring Hall at Stoke-by-Nayland right on the Essex-Suffolk border. The Howards were local gentry, not nobles and not large landowners of the kind they were to become in the course of John Howard’s lifetime. John Howard owed his rise less to his marriages, which were to Catherine, the daughter of Lord Moleyns between 1440 and 1442 and, secondly, to Margaret Chedworth (nee Wyfold), than to his family connections and local service. He began his career in the household of his cousin, John Mowbray, Duke of Norfolk, and was involved in all sorts of local disputes over land, particularly hunting on land owned by the enemies of his master, the de la Pole family. One of his contemporaries described him as a wild bullock at this stage of his life. He was elected to the House of Commons four times between 1449 and 1461, serving as a Justice of the Peace in Norfolk and Suffolk and as a Sheriff of both counties. By the early-1460s, he had built up an estate of sixteen manors to which he added a further six forfeited by the de Veres in 1463. He was a man of local substance by then and an assiduous student of his own accounts which show him to have been a careful and efficient administrator and manager. What really made Howard’s career was his military service to the Yorkist cause. He led the Duke of Norfolk’s men to the largest battle of the Wars of the Roses at Towton in 1461 and then served as part of the Yorkist army besieging the castles at Alnwick, Bamburgh and Dunstanburgh in 1462-1463. He was also involved in campaigns in Wales and the North of England against the Lancastrians in 1464. After the brief return of Henry VI to the throne in 1470, Howard fought for Edward IV at the battle of Barnet in 1471 which destroyed the Lancastrian cause for a generation. If he had been asked what his profession was, he would certainly have said he was a soldier first and foremost. A soldier, yes, but also a diplomat. Edward IV started to use him in missions to the Dukes of Burgundy and to Louis XI of France in 1467. In 1468, he went with the King’s sister, Margaret, to Burgundy for her marriage to Charles the Bold of Burgundy. One of the French chroniclers and diplomats in the 1470s, Philippe de Commines, who got to know Howard well, thought that English representatives were not as cunning as his own countrymen but were more straightforward: even so, it was necessary not to affront them and dangerous to meddle with them. This fits well with what is known of Howard, who like other English Councillors benefited from a pension of 1200 crowns from Louis XI of France. When Edward IV died in 1483, Howard was a significant figure in East Anglia and had been a baron since 1470. Richard, Duke of Gloucester, the dead King’s younger brother, secured his support two days after he seized the throne by creating him Duke of Norfolk and Earl Marshal (28 June, 1483). Through his mother, Howard had had a claim to a half share in the Mowbray family’s estates when the last Duke of Norfolk died in 1476 but Richard of Gloucester had had his rights overridden. Now, Howard got the Mowbray lands in East Anglia, Surrey and Sussex as a reward plus twenty former de Vere manors in Essex and East Anglia. Norfolk spent most of the period between 1483 and 1485 in the Eastern counties where his estates and homes mainly lay. His accounts for the period of Richard III’s reign give us our first detailed information about Wivenhoe Hall. There was clearly a very large park here. Its keeper was paid 4d for his wages on one occasion. Hunting took place in the park and, possibly, shooting too. Rabbits, always one of the staples of medieval diets, were trapped here and either eaten or sent to the Duke’s other residences. Two pools were laid out at the Hall and evidently cleaned too at a cost of 6s 8d and 13s 4d on the occasions recorded in the household accounts. 11 ½ d was spent on beer for the labourers working on the pools for two days, 7d on eight cart horses and 2 shillings on a fire, which suggest they were of some size. There is also material on other activities here. A bricklayer called John Perrekyn from Mile End agreed to make 80,000 bricks in a kiln here subject to the Duke providing the necessary wood, sand and straw. Since bricks are heavy and therefore difficult to transport, it would be interesting to know whether these were for use on site or elsewhere. Unfortunately, this question cannot be answered. The blacksmith of Wivenhoe, a man called Necolas, does seem to have done well out of the household’s presence. He was paid 1s 8d and 13s 8d on successive occasions to produce serpentines, which were small handguns or matchlock firearms which were set off by a slow-burning piece of rope or twine. At least three were made with nine chambers and 2 with 11 chambers by the blacksmith. Later, he was paid £1 2s 6d by the Duke to produce artillery pieces for his vessel, the Barbara, using nine hundredweight of iron to be supplied by the Duke. This kind of weapons production required quite advanced technical skills for the late-fifteenth century. And there is a lot of evidence of a rather repetitive kind about the purchase of beef and horsemeat, of beer, bread, butter, candles, cream and milk for the Duke’s household. There are glimpses too of his Duchess hiring boatmen to take her up the river Colne to Colchester for which she paid 2d and gave a tip of 1d for beer to the men. Nor did the household lack entertainment or spiritual instruction. The players of Coggeshall came at least once and there was a chapel with its own choir of boys who had to be fed and clothed. What the accounts refer to as a ‘disguising’, which was probably a primitive kind of masque, was also performed in the Hall. What is also intriguing are the hints of relationships between the Duke and local people. He personally oversaw the hiring of men for his service. John Coteler was taken on for wages of 10 shillings in 1483 and another local man called Lorkyn got what we would call a bonus of 3 shillings and 4d. We can be sure too that the Duke oversaw the checking of his accounts from the surviving manuscripts. Wivenhoe was useful to him in other respects too. He was a ship-owner and Admiral of England from 1483 to 1485 when he was responsible for preparing vessels on expeditions for himself or the King. A Wivenhoe man called Kunste was paid £5 for forty nights work he and his men did on a vessel called the Barbara before it sailed to Bordeaux. And a carpenter called Parker got 10 shillings for work he did on one of Norfolk’s vessels here. These incidental details help to provide a partial picture of life here in Wivenhoe in the mid-1480s. Richard III’s seizure of the Crown enabled John Howard to reach the apex of English society. For John de Vere, in prison at Hammes Castle near Calais, it left him with no option but to escape and join Henry Tudor if he hoped ever to regain his estates. He did so in November, 1484 taking with him his jailer, the disaffected Yorkist, Sir James Blount. Henry’s followers by then included a number of former adherents of Edward IV to whom Oxford was acceptable. Oxford as an experienced soldier was the obvious figure to command Henry’s troops once they reached these shores in August, 1485. He commanded the vanguard at the battle of Bosworth on 22nd August when he found himself facing Richard’s main force commanded by the Duke of Norfolk. Oxford kept his men tightly packed together in order to prevent them being overwhelmed by superior numbers. When the Duke of Norfolk was killed quite early in the conflict, Richard’s men began to retreat under pressure from Oxford’s troops. It was at this point that Richard III led an assault on Henry’s bodyguard and was himself killed. With their leaders dead, Richard’s forces fled. It was a triumph for Henry VII and for his battlefield commander, the 13th Earl of Oxford. Oxford naturally enough re-gained his former estates after the battle of Bosworth. An Act of Parliament in the autumn of 1485 reversed his attainder and restored his properties. Interestingly enough, the Act described Oxford and his two younger brothers as being ‘of Wivenhoe’, which suggests they thought of this place as their original and primary home rather than Castle Hedingham. Oxford also got the inheritance of the Scales family and, from 1487, was responsible for overseeing the affairs of his former companion-in-arms, Lord Beaumont, who was incapable of managing them himself. Beaumont and his wife apparently lived here in Wivenhoe Hall until he died in 1507: a year or two later, his widow became Oxford’s second wife. Both are buried behind me before the alter as their brasses indicate. Oxford certainly profited from the new Tudor regime. He was appointed Admiral of England and Constable of the Tower of London in September 1485 as well as becoming Steward of the Duchy of Lancaster south of the river Trent and Steward of the Forest of Essex. His landed income of c.£3,000 a year plus his fees and profits from the sale of wardships and feudal rights made him one of the wealthiest early sixteenth-century peers. This extra income (without any borrowing) was invested almost entirely in land purchases across northern Essex and in the counties of East Anglia. He was a regional magnate on a scale and of a kind no previous member of his family had ever been. Oxford appears to have taken a generally conciliatory line towards former Yorkists in this area. Norfolk’s widow and the wife of his eldest son, the Earl of Arundel, were under his protection as their ‘good lord’ in 1486: the Howard family re-gained six of their manors from Oxford in 1489 in return for the payment of an annuity for his lifetime. His nephew and heir, Robert de Vere, married the Earl of Arundel’s daughter by 1514. Oxford seems to have taken the view that the Howards were a permanent feature of the landscape and were likely to work their way back into royal favour, a view that was vindicated by events. We can see him acting with similar generosity to former Yorkists like the Tyrell family and to Henry Bourchier, the 2nd Earl of Essex, who came of age in 1498 but who was in Oxford’s shadow. Gradually, Oxford drew a substantial proportion of the gentry of Essex and East Anglia into his affinity. He undoubtedly had a major say in the exercise of patronage as aa far as local offices like the Commission of the Peace and Shrievalties were concerned: four of Colchester M.P.s between 1485 and 1511 were his nominees as was one of Maldon’s; there were probably more. Light rule worked: there was no prolonged disorder or violence in these places as long as he lived. The survival of his account book for 1507 tells us most about his relationship with Wivenhoe. 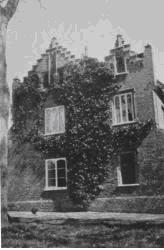 It had been his parents’ favourite home and it was here that he came after his first wife’s death. We can see what his household of one hundred and fifty people purchased. This number indicates that Wivenhoe Hall was a very large house indeed if it could accommodate that many people. It was almost certainly much bigger than Layer Marney Towers, the construction of which began in 1505. It may, perhaps, have been the largest house in Essex or in the East of England at that time. Day by day, this household’s purchases of meat and fish were recorded: month by month, its acquisitions of ale and beer, corn, spices and wine, of candles, oxen, sheep, salted fish and firewood were itemised along with the quarterly payment of wages, – we may not have a plan of Wivenhoe Hall but we can tell from this account book that it had extensive stables capable of housing dozens of horses: it had storerooms for salted fish and meat; a wood store; sleeping quarters for the Earl’s senior household officers and his family and a large hall as well as a chapel – all of them in Latin numerals and each one checked by the Earl himself. It is likely that he was just as careful in checking his annual accounts, which now survive in fair copies. No one who rose to the top of English society and who hoped to stay there could afford not to exercise careful oversight over his and his family’s affairs. The Earl was clearly keen on music. His chapel of about ten boys with its master was the only noble chapel ever to perform for the royal household in May, 1506. In 1507, there were payments to minstrels from the households of Prince Henry, of the King, Lord Scrope, Lord Darcy, and the Earl of Arundel spread throughout the year. There were other entertainments too. In December, 1507, four players from Sudbury put on a pageant in the Hall while five Colchester men put on a ‘disguising’ in the same venue. The Earl’s Council later that month were present when four players from Lavenham performed twice and four from Bocking performed once. It is possible that the house was decorated too: £7 was paid to the Earl’s servant, William Oakley, to buy gold and silver paper, tin foil and counterfeit pearls in London. Admittedly, we do not know what the content of these entertainments was but they may have fostered a sense of communal spirit amongst his household men. The household accounts also offer us some insight into the Earl’s religious life and that of his household. Wivenhoe Hall evidently had its own chapel where Dr Talbot preached on Good Friday and Easter Sunday in 1507: he was paid 13s 4d for his two sermons. But Oxford also worshiped in this parish church too. The head of the Black Friars in Cambridge received 10 shillings for a sermon as did a friar from Oxford. Four other clergymen, two from Cambridge, one from Bakewell and one, a friar, from Colchester, got the lower rate of 6s 8d. The gift of 6s 8d to the parish priest of Wivenhoe for the feast of St Nicholas might have been an act of piety but it could have been an example of the irreverent practice of appointing a boy Bishop to preside over services and even give sermons before Christmas. If the latter, it testifies to a sense of humour on the Earl’s part. Oxford’s time in Wivenhoe was probably one of mourning for his first wife. His second marriage appears to have occurred around November, 1508 and was to the widow of his old companion-in-arms, William, Lord Beaumont. It may have been a marriage of affection – she must have been well known to him by then and his settlement of twenty seven manors on her as her dower was exceedingly generous – or it may have been one of convenience enabling him to retain control of her estates worth about £500 a year at that time. We cannot tell although, at the age of 64, Oxford apparently still hoped for children. He was to be disappointed: he died at Hedingham on 10th March, 1513 at the age of 71: he was buried seventeen days later in Earls Colne Priory before a congregation of 900 mourners, including peers, knights and gentlemen from all over Essex and East Anglia. He was undoubtedly the most powerful man ever to have lived in Wivenhoe and the most influential individual in the history of Essex until the mid-seventeenth century. His widow apparently remained here until her death in 1537. Her will required that she be buried next to her first husband but it also tells us about the people in her household to whom she left bequests: some were her personal servants and probably Wivenhoe women: other beneficiaries were men like her two chaplains, Ralph Bane and Robert Skinner; her Marshal of the Hall, John Fabian, and her Gentleman Usher, Robert Goldingham. To this church, St Mary’s, she left a number of rich altar cloths and vestments, a chalice and a cope. She also asked that two hundred masses be said for her soul in the parish church of Wivenhoe and elsewhere. In that sense, she was still a Catholic although obedient to Henry VIII’s Reformation. Exactly what happened to Wivenhoe Hall is sadder still. In 1562, it passed into the hands of Edward de Vere, 17th Earl of Oxford. It was subsequently sold during his rake’s progress to the Townshends of Raynham in Norfolk. By 1594, the surveyor, John Norden, noted in his description of Essex that the house was ‘much decayed’. It was last shown on John Speed’s 1611 map of Essex: by 1627, it and the great park had disappeared. It was certainly the largest house ever to have been in Wivenhoe. © Christopher Thompson. All rights reserved.